Ships from and sold by childrensbooks. The period measured by the life of George Washington 1732 to 1799 was one of revolution and change in many parts of the world as Enlightenment thinking took hold in the minds of men. When George was a young man, Benjamin Franklin was the most well-known American, Louis XV was on the throne of France, and George II was king of England. Father Junipero Serra had just arrived in Mexico to work with the Panes Indians. Mozart and Bach were writing their immortal music and Voltaire warred with his pen against Ignorance, Injustice and Superstition. The young nobleman Lafayette watched the feisty American colonies with fascinated interest as they stood up to Mother England when she sought to tax them unfairly. James Cook was sent by the Royal Society of London to Tahiti where their team of astronomers might observe a total eclipse of the sun and thereby accurately measure the distance between the earth and the sun. These are just a few of the wonderful narratives explored by Foster in her Newbery Honor Book of 1940. 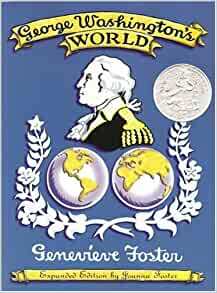 Prolifically illustrated with intriguing line drawings and detailed timelines, Foster's telling of the life story of George Washington does justice to the man it celebrates. This book was recommended to me by my daughter's 5th grade Catholic curriculum... so it was a surprise to me to CONSTANTLY have to talk over "issues" with her. First, I have to say that the author does an awesome job of pulling in the children and making history interesting. I LOVE that! I just wish some of the subject matter wasn't so "inaccurate". So if you have an issue with any of the below, then avoid or plan to talk over quite a bit with your children. But if none of it bothers you, go ahead and order and you will be very pleased! Frederick "The Great" was the first instance of frustration for me. They portray this greedy warmonger as almost an idol to be looked up to; even though he was basically a pre-cursor of Hitler with his drive to conquer the world (thankfully not with Hitler's anti-Semitic leaning). Same with Napoleon. But what was frustrating even more was the fact that they portrayed Frederick's rivals very negatively; basically the author had chosen to elevate Frederick and so the very solidly Catholic Prussian Empress Maria Theresa is portrayed very negatively in spite of the fact that she was simply defending her country which Frederick was trying to steal from her! For those of you who are not aware, she was a solid Catholic figure and was very morally upright (one of the few very solid Catholic's in the history of the world's elite! ); so it's particularly frustrating to see her portrayed this way. The second instance of frustration (which is a huge part of the 2nd half of the book) was the positive portrayal of Voltaire and the French Revolution. I am all for freedom; but comparing the French Revolution with the American Revolution is a huge disservice to the Americans! The Americans were striving for all that was good and they did it in such a way that was just (with perhaps a few individuals that went off the moral arrow). The French Revolution was a completely anti-religious movement (hugely pushed to start with by Voltaire, who stressed that all priests should be murdered, etc...) that was more of a rebellion against authority and tradition. And although I believe strongly in freedom for all, to get your freedom by doing unjust things and murdering thousands by guillotine for their political beliefs is quite another story. The French Revolution is portrayed very positively until the end when all the massacres are taking place. There is no mention of Marie's son basically rotting in prison at the tender age of 10. Marie Antoinette is portrayed as a frivolous little girl the entire time who has her heads in the clouds (perhaps an accurate picture of the 12 year old who got married, but not accurate of her after having children in her 20's and 30's); of course there is no mention of the unjust trial against her; just that she was executed. Her husband, a simple but generally good man, is portrayed as a dolt. What was especially frustrating is the little blips of positive quotes by some famous Americans who seem to be "for" the French Revolution. Now I don't mind this type of history in the older grades because they can logically decipher fact from fiction, but for my daughter's first portrayal of some of these characters? I ultimately got frustrated with having to talk over every little bit with her and decided to skip the second half of the book. My comments on the issues in the book are just a SMALL EXAMPLE OF WHAT IS WRONG in the book. Hopefully this will alert fellow Amazon-ers to some potential issues. If you don't have issues with any of the above because you have something solid to counteract some of the inaccuracies, then you will probably love this book for it's pull towards children. My daughter absolutely loved reading history when reading this book, so that is a huge plus. For all others, avoid like the plague! 3.0 out of 5 starsGet the old version if you can. I don't recommend the expanded version. While it shares much with the original version, there have been some troubling changes. This book is not a biography on George Washington, but rather history told in time slices using the life of George Washington. This author is a great story teller who is easy and fun to read. The tone and feel is that of a journey through the 18th century. The people that are covered include George Washington, Daniel Boone, John Adams, John Hancock, Thomas Jefferson, Ben Franklin, Marie Antoinette, Louis XIV and XV, Napoleon, King George III and many more. There are also events such as the French Indian War, Revolutionary War, the French Revolution, and Napoleonic Wars. Important inventions such as the hot air balloon and others are also discussed. Also included are pictures and diagrams that make the book even more interesting. If you are looking for a book that opens up the world view of the 1700's then this is your book. Fabulous book for teaching history. Much more effective than dry textbook facts. Enables history to come to life so that students will care! A great look at what was going on around the world during the life of George Washington. The book was in brand new condition. Delivery was made as expected. Happy. We are using Charlotte Mason's philosophy for homeschooling and this book came recommended. Love, love, love this author! !